This is the unofficial version of DotA 6.76c AI by a Chinese player. Fully ported to official v6.76c. 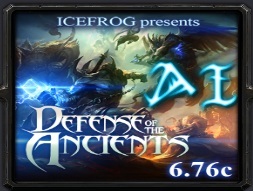 Description: DotA 6.76c AI Simple by DotaER. Translated to English. Ported to official DotA 6.76c AI. Bugs and glitches might occur since it’s not an official release. Enhanced version of DotA 6.74c v1.3b AI.